Save Money on your Halloween Costumes NOW! Get Halloween costumes for the whole family- including the pets this year!Now you can shop at Our Halloween Store!The link is above. This page is filled with valuable resources for your costume and decorating needs. 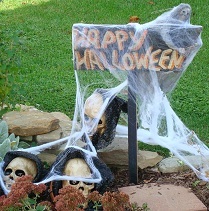 And I added more photos on Halloween decor used in my landscape to get you in the mood! If you like funny, scary or somewhere in between as your fashion choice for the scariest day of the year, you can definitely find it here. 10% OFF on Pet Costumes at dog.com! Save Now! Are you having a big Halloween party and don't know what to wear. Don't worry you have arrived at the ultimate Halloween shopping destination. The kids and adults can find the perfect attire from these online Halloween sources! You will find more than just costumes at the links on this page. They are also Halloween party supplies, and Halloween decorations for the scariest party you can imagine. 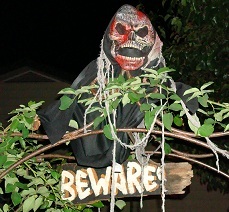 I have thrown in a few of my favorite photos of Halloween decorations from my yard this year and a few years past. So enjoy the photos and shop till you drop from my Halloween costume page! And pass this link on to your friends so everyone can be properly dressed this Halloween. These photos shows a few skulls coming out of the landscaping! 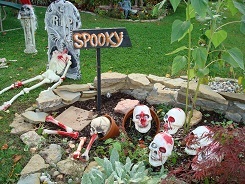 This photo shows some landscape decor items decorated for Halloween. The 3 stumps which are now creatures, didn't start out looking this way on their own. Now they are all ready to spook visitors on Halloween! 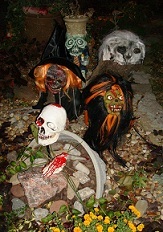 Here are a few scary creatures just hanging around the front yard! And another Scrappy Sign by Rented Mule. 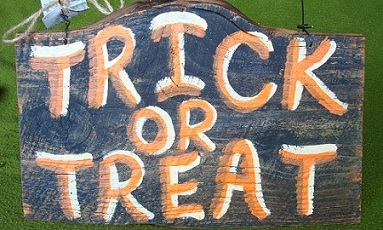 If you notice in the photos on this page the Scrappy Signs make great additions to your Halloween decor. And have a safe and Happy Halloween! Order you Scrappy Sign today, custom signs are also available, any wording! Sometimes the simplest Halloween decorations can be the best. 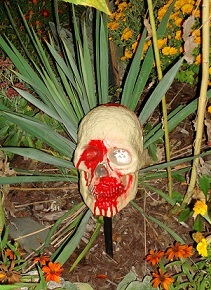 I placed a skull in my new flower garden in front of a yucca plant and he looks like he has green spikes! 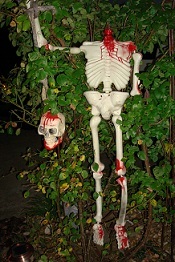 The headless skeleton is just hanging out on the trellis waiting to great visitors. 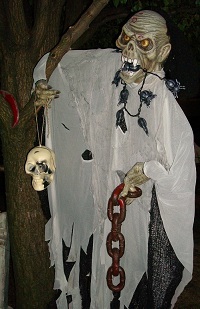 This time the creature is hanging from the tree behind the graveyard munching on his spider necklace and holding a skull and chain. He looks vicious, doesn't he? 10% OFF at dog.com Halloween Store! 10% OFF at dog.com Halloween Store! Shop Now!